Oil companies have quietly agreed to pay tens of millions of dollars into a compensation fund for deaths and damage caused by a 2013 oil-train explosion in Quebec, though the energy industry has maintained it wasn’t responsible for the disaster. Royal Dutch Shell PLC, Marathon Oil Corp., ConocoPhillips, Irving Oil Ltd. and others have contributed to a $345 million fund for victims of the accident in Lac-Mégantic, according to court filings and interviews. If U.S. and Canadian courts approve the fund, the companies would be shielded from several lawsuits claiming wrongful death and negligence in connection with the tragedy. Montreal, Maine & Atlantic Railway Ltd., the small railroad hauling the crude oil, sought bankruptcy protection soon after the accident, in which an unattended train carrying oil from North Dakota’s Bakken Shale formation derailed and erupted into flames, killing 47. A trustee appointed by the bankruptcy court, who has approved the compensation fund, contended in court filings that oil producers were well aware the oil they were selling was dangerously volatile and failed to take action to make transporting it safer. Oil companies, however, have said that their responsibility ended with properly labeling the crude oil after pumping it out of the ground, which they say they did. Bankruptcy court has become a common arena for settling complex litigation alleging negligence by multiple parties. Bankruptcy trustees, by statute, can seek a centralized settlement, including a compensation fund, to streamline the process and avoid a lengthy legal battle. Most companies identified in court filings as participating in the proposed Lac-Mégantic settlement declined to comment. The size of their payments are generally sealed by the court, including contributions from a unit of General Electric Co. and other railcar leasing firms. But Marathon Oil, which produced some of the crude involved in the Lac-Mégantic disaster, said its decision to pay into the fund wasn’t an acknowledgment of liability. In the almost two years since the Lac-Mégantic disaster, there have been nearly a dozen other fiery derailments involving crude oil from North Dakota, though no fatalities. Despite a recent decline in shipments caused by lower oil prices, nearly one million barrels of crude are loaded on trains every day, according to federal statistics, up fromalmost none before 2009. U.S. and Canadian rail regulators have ordered railroads carrying crude oil from the Bakken Shale to take precautions including slowing down oil trains, and are also requiring shippers to phase in stronger tanker cars that can withstand accidents without rupturing. Some U.S. officials, however, have complained that oil companies haven’t agreed to make their crude oil safer to transport by stripping out volatile gases before putting it aboard trains. North Dakota imposes some limits on such gases. Until earlier this year, it wasn’t unusual for oil producers to provide train operators with generic—and often outdated—information about the physical characteristics of crude-oil cargoes. New federal rules and North Dakota law now require additional crude testing. Matt Gatewood, a partner at Sutherland Asbill & Brennan LP who has defended energy companies in complex safety litigation, said companies involved in shipping crude oil need to be careful about testing it. “They have to be fully aware of what it is they are selling and give an accurate representation of it to the company they are selling it to,” he said. Earlier this week, World Fuel Services Corp. said it agreed to pay $110 million into the Lac-Mégantic fund. The oil was hauled first by Canadian Pacific Railway Ltd., and then by Montreal, Maine & Atlantic Railway. Canadian investigators and Montreal, Maine & Atlantic’s bankruptcy trustee contend the crude oil was more volatile than its label indicated. World Fuel didn’t return calls seeking comment. The crude was to be delivered to New Brunswick refiner Irving Oil, which has agreed to pay $60 million into the compensation fund. “Everyone involved in transport of crude oil is responsible for safety,” said Robert J. Keach, the bankruptcy-court trustee. A trustee’s role is to recover as many assets as possible to pay creditors of the company whose bankruptcy case he oversees, often by bringing claims against other companies. Canadian Pacific hasn’t agreed to pay into the fund. 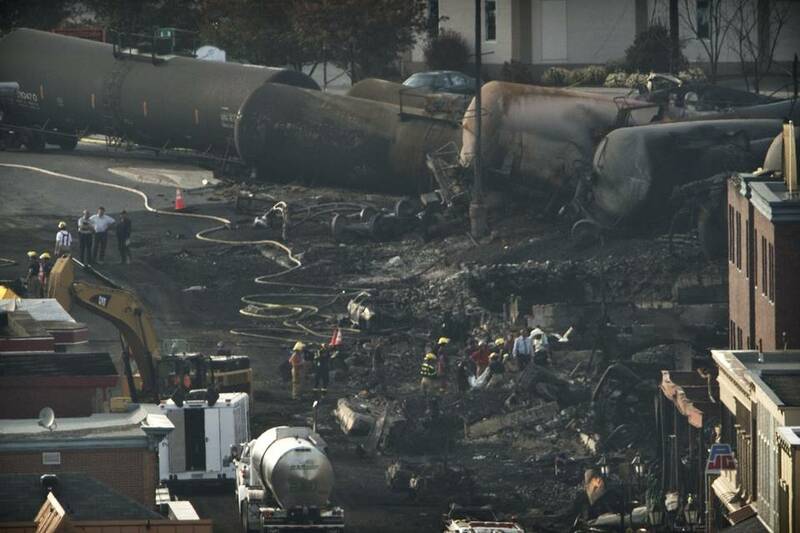 A Canadian Pacific spokesman said compensation should be from companies “responsible for the derailment,” and not from companies that want to be shielded from future lawsuits. A spokeswoman for Lac-Mégantic’s local government said she hoped the settlement will let the town’s 6,000 residents “turn the page” on the accident.